The University is pleased to have you as a partner. Your cooperation and compliance with our guidelines is an important element in maintaining the vendor relationship. Click on Parking Policies and Procedures (rev. March 2018) to view all the rules for parking on campus. A valid UM parking permit is required while parked on campus. Depending on your need, there are several options for parking. 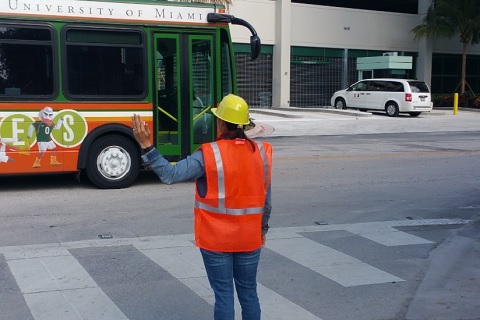 The following information is important because it establishes responsible practices that comply with the University’s guidelines and the ordinances of the City of Coral Gables. You will find specific details regarding the ingress & egress campus access roads to use, approved loading & unloading areas and governing policies. Follow this link to familiarize yourself with the governing policies. You can pay to park using PayBy_assets/pdf/paybyphone-howto.pdfPhone and will need to enter your vehicle's license plate during the payment process. For an application and information, contact Parking and Transportation at 305-284-3096 or visit us at McKnight Building, 5807 Ponce de Leon Boulevard, Coral Gables, Florida. Long-term parking is not intended for storage. If you chose not to drive, you can take advantage of the discount fares and programs offered by Miami Dade Transit. Some discount categories include Golden Passport, Patriot Passport (Military Veterans), Commuter Reduced Fares, and People with Disabilities. To learn more visit Miami-Dade Transit. In addition to public transit, you can also get to campus by carpooling with a co-worker, friend, or family member using the RideFlag mobile application. To learn more click here or download RideFlag at Google Play or Apple Store.